Seascape in Southerness, near Dumfries sleeps 8 people. Set in the seaside village of Southerness, Seascape is a detached holiday property is just 500 yards from the sandy beach and is an ideal base from which to explore south west Scotland. Seascape enjoys a sea view to the south and views of Criffel and the Galloway Hills to the north. 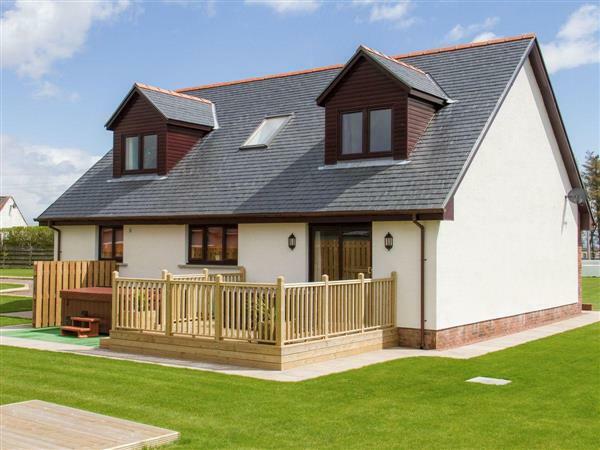 Ideal for family and friends to relax and unwind in, the property boasts something for everyone, whether indoors or outdoors, with a hot tub and a games room. Located on the spectacular Solway Coast near Dumfries and close to the stunning Galloway Forest Park, Britain’s largest forest park, this is a popular area for walkers and cyclists with world class mountain biking at Dalbeattie 7 Stanes nearby. The area offers unspoilt villages, dramatic coastlines, sandy beaches, rocky coves, magnificent gardens, castles and ancient monuments. Wildlife abounds and the RSPB nature reserve is just along the coast. Other activities include fishing, riding and sailing. Championship golf course, Southerness Golf Course, is just 500 yards away, with a further good selection of golf courses within Dumfries and Galloway. The small village of Southerness with its quaint lighthouse that stands on the Solway Firth is well worth a visit, and 3 miles away is the home of John Paul Jones (founder of the American Navy). Sweetheart Abbey, Drumlanrig Castle and Gardens and Mabie Farm Park are all within easy reach. A beach is only 500 yards, the shop is is 300 yards, with the pub and restaurant being ¾ mile from Seascape in Southerness. Ramp to entrance. Ground floor: Living room with patio doors/dining room/kitchen with breakfast area. Utility room. Games room. 1 twin bedroom. Wet room with toilet. First floor: 3 bedrooms: 2 double (5ft), one with en-suite shower room and toilet, 1 twin. Bathroom with shower over bath and toilet. Gas central heating, gas, electricity, bed linen and towels included. Travel cot. High chair. Freeview TV. 42 satellite TV (movie and sports package). DVD. CD. iPod dock. Playstation. Gas/electric range. Microwave. Washing machine. Tumble dryer. Dishwasher. Freezer. Wi-Fi. Enclosed lawned garden with decking, sitting-out area and furniture. Ample parking. Cycle store. Hot tub. Games room with pool table and dart board. Welcome pack. No smoking. Wheelchair access. Holidays at Seascape in Southerness run from Friday to Friday. For a better idea of where Seascape is, you can see Seascape on the map below. You can find more large holiday cottages (that's cottages which sleep 8 or more people) in Dumfriesshire. If you want to see more large cottages, have a look at large cottages in Dumfriesshire. Seascape is in Dumfriesshire; should you be on the lookout for a special offer, you can find all the special offers in Dumfriesshire. It's always worth checking to see what is on offer at the moment. Do you want to holiday near Seascape (30501), you can see other cottages within 25 miles of Seascape; have a look to find your perfect holiday location.